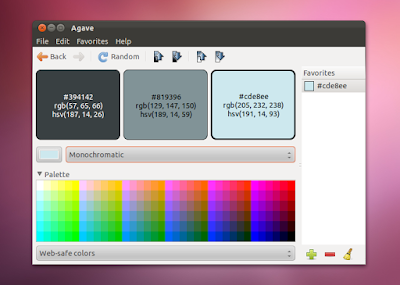 Agave is a very simple application for the GNOME desktop that allows you to generate a variety of colorschemes from a single starting color. It is free software licensed under the open-source GPL License. Ok folks. We all know that people belonging to our tribe, the tribe of nerds, are not famous for their taste and ability to match colors. Linux conventions are filled with people dressed in very horrible color combinations. Even when it comes to choosing the right color scheme for a website, nerds are not exactly the best specimen around and that’s why for every website we make, it is better to get the help of a professional “color picker”. But us nerds are good at computing and have tried to exploit the formula for perfect color matching. They made an algorithm out of it and put it inside Agave, a software that will quickly become your best friend, if you mind about looking decent. Given any color Agave is able to pick up the perfect match, which will let you save time, money and honor while picking up your clothes or while painting the walls of your room. Agave features also the possibility to obtain the hex code for each color, so that you will simply have to copy-paste it in your code to have a decent looking website. Agave also offers some lists of web-safe colors, giving you the opportunity to pick up from a list of colors that won’t give your readers headaches or vomit. Agave is the best friend for people like me, people that constantly fail at picking up decent color combinations. Believe it or not, Agave totally changed the way I present my work, making it look better designed overall. Agave comes under the terms of GPL and it can be freely modified and redistributed. Install it simply by searching for it in the Ubuntu Software Center or by typing “sudo apt-get install agave” in your favorite terminal.